Rain, snow, graupel, sunshine, clouds – we had it all this Sunday. The ominous looking sky preceded some heavy precipitation. Despite it being late March, some of the heaviest snow showers whitened the ground even during the afternoon. Overnight some locations received one to nearly two inches of snow. Waves of precipitation moved in from the ocean with our weak disturbance moving through. This precipitation will end overnight. Clouds will start clearing out after midnight. Under clear skies it will turn cold tonight. Overnight lows will drop into the 10s and 20s. High pressure will be overhead for the first two days of the work week. Sunny skies are expected for Monday and Tuesday. Monday will be relatively chilly still with highs nearing 40°. Tuesday will be warmer with temperatures closer to average in the middle 40s. High pressure will slide out to sea Tuesday night allowing a warm front to move north. Showers will return Wednesday and Thursday, but it will be 10-15 degrees warmer! High temperatures will reach the mid to upper 50s by Thursday. 50s are possible through the weekend. A round of steady and locally heavy rain will move in by the end of the week. At this point 1-2” of rain will be possible. We will have to keep an eye on the local streams and rivers. With above average precipitation lately and significant snow melt, flooding is a possibility. This is still several days away so be sure to stay tuned. Tonight, there will be a gradual clearing.It will be chily with lows in the mid-20s. 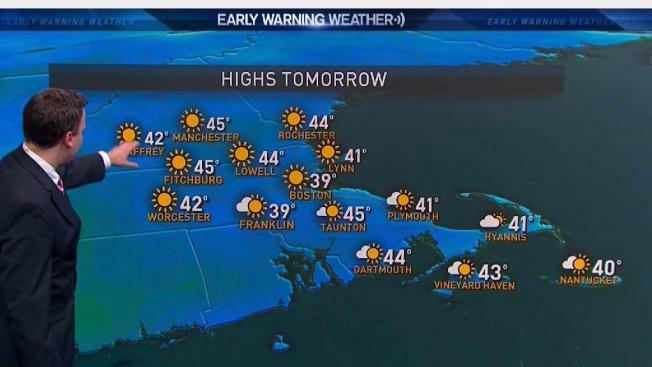 Tomorrow will be mostly sunny and cool, with highs near 40 degrees. Tuesday will be mostly sunny and seasonable, with highs in the mid 40s. 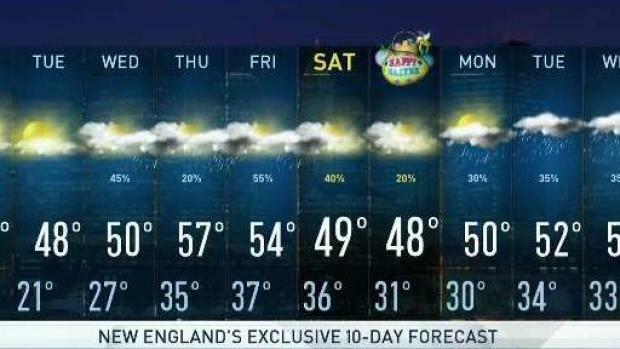 Easter Sunday should be drier. I think most of the region will be caught between two storm systems. The ground might be a little damp Sunday morning for your Easter Egg Hunts, but much of the day will be dry. The next round of rain will arrive early the following week.